Holiday.gr - Alyki, a trip to a myth! 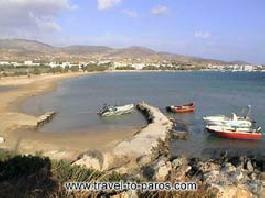 Aliki is the eastern village of Paros. It is located 13 km from Parikia. Its beach is one of the most popular in the island and among the biggest. It has a blond shore. Because of the frequent north winds in the summer, it is ideal for surfing. If you love diving, the depth of the sea will charm you. The remains of the ancient town are inside Aegean Sea. The region has big tourist development. Options for accommodation, food and pleasure satisfy all tastes. Been to Alyki ? Share your experiences!